The perfect fall recipe – this Sausage and Butternut Squash Slab Pie is filled with comfort! Sausage, butternut squash and cheese are a perfect match! Preheat the oven to 425ºF. In a bowl, combine the butternut squash with 1 tablespoon of the olive oil. Season with salt and pepper and stir to coat. Arrange the squash in a single layer on a baking sheet and roast in the oven until the squash is tender and browned, 30-35 minutes. Meanwhile, heat the remaining 1 tablespoon of olive oil in a large skillet. Add the sausage and cook, breaking it up with a spoon, until browned and cooked through. Once cooked, add the garlic and cook until fragrant, about 30 seconds. Remove from the heat. Add the roasted squash and stir to combine. Combine the egg with 1 teaspoon of water in a small bowl and beat to combine. Lightly flour a surface and roll each of the puff pastry sheets into 10×12-inch rectangles. Transfer one of the puff pastry sheets to a parchment lined baking sheet. 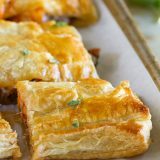 Leaving a 1-inch border around the puff pastry, spread the sausage and butternut squash mixture evenly over the puff pastry. Sprinkle the mozzarella over the top, then dot with the ricotta. Drizzle the marinara over the top of the cheese, then sprinkle with half of the basil. Place the remaining sheet of puff pastry over the top, lining the edges. Press the edges together to seal, then use a fork to crimp the edges. Brush the egg mixture over the top of the pie. Cut 4 slits in the top to allow steam to escape. Bake the pie until the pastry is puffed and golden, 20 to 30 minutes. Sprinkle with the remaining basil. Cut into 4 pieces to serve.